The headquarters of SunEdison is shown in Belmont, California. 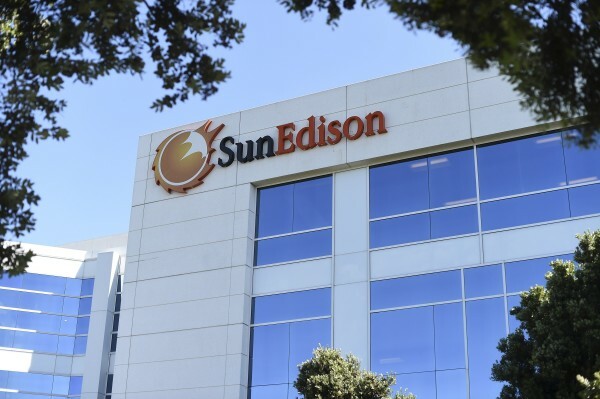 U.S. solar energy company SunEdison Inc. filed for Chapter 11 bankruptcy protection Thursday, becoming one of the largest nonfinancial companies to do so in the past 10 years. Once the fastest-growing U.S. renewable energy developer, SunEdison embarked on an aggressive acquisition strategy that left it struggling with $12 billion in debt. Although solar project developers such as SunEdison continue to benefit from robust demand, their shares have been hit by investor concerns that demand could fall in tandem with weak oil prices. SunEdison has struggled with its own list of problems, as well. Breakneck expansion during 2014 and 2015 left the company saddled with huge debt. The company acquired wind developer First Wind for $2.4 billion more than a year ago, giving it and its affiliated companies control over proposed and operating wind projects in Maine. In addition, the company has become embroiled in disputes with its yieldcos, or publicly-traded subsidiaries that own and operate renewable energy assets, some of which were acquired from SunEdison. One yieldco, TerraForm Global Inc., is suing SunEdison for breach of contract, alleging it misappropriated $231 million of TerraForm’s cash. TerraForm Global, which had warned that SunEdison was at “substantial risk” of bankruptcy, said last month that SunEdison, its controlling shareholder, may not transfer to it some solar energy projects in India and Uruguay and may not complete other deals. Billionaire David Tepper’s Appaloosa Management is seeking to overhaul the Conflicts Committee of the other yieldco, TerraForm Power Inc., claiming the company’s controlling shareholder, SunEdison, breached its fiduciary duties. SunEdison itself faces about two dozen legal claims, mainly by shareholders who accuse the company of misleading them about its financial position. The company has delayed filing its annual report twice after identifying material weaknesses in its financial reporting controls. SunEdison also is being investigated by the U.S. Department of Justice and the U.S. Securities and Exchange Commission over the failed Vivint Solar deal and other issues. Early in March, Vivint terminated the cash-and-stock deal, worth $2.2 billion when it was forged in July 2015, after SunEdison failed to close on the planned acquisition. SunEdison’s financial troubles have imperiled dozens of projects underway globally. The company has sold or is trying to unload some of them, while others are scrambling to line up new financing.